Static in hair is very annoying. The instant temperature drops, the heaters turn on, and the air dries up, everything seems charged up. If you are a fine-haired girl like me then you might find it impossible to hold and maintain a decent style. Static hair is ruining it all. So why the heck do you get static hair? What’s the physics behind static hair: When there is friction between two different materials, electrons form one material may jump to the other, causing charge imbalance. First thing, first. 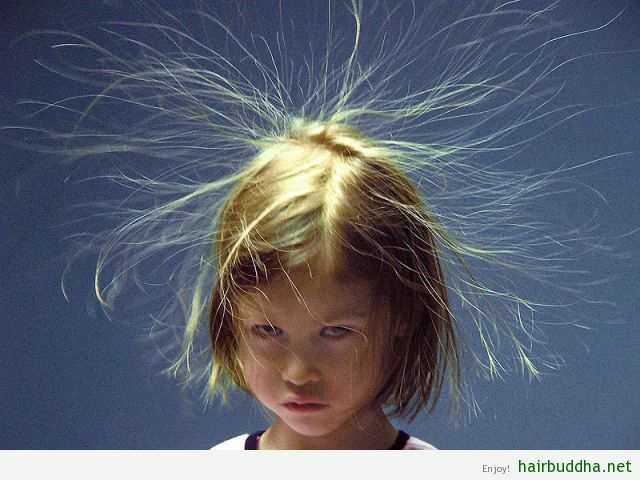 Your attempt to keep hair too clean adds to creating electrical charge. If you shampoo every day you are stripping away every drop of natural oil from your hair, leaving it too dry, and therefore prone to static. Shampooing every second or third day will allow the natural oils from your scalp to moisturise your strands and thus battle the static. Try these tips to help you go more days without shampooing your hair. Also, switch to homemade shampoos such as this, which is free from harsh detergents and preservatives. More moisture means less static. A hydrating hair spray is one of the easiest way to beat static charge and keep your hair from floating to the sky. Standard spray can contain alcohol, which can further dry your hair, and make static problem worse. You can make an immensely moisturising and lovely smelling spray at your home. And that too with just 2 ingredients: Rosewater and vegetable glycerine. Rosewater keeps hair hydrated and nourished, while glycerine, a natural humectant, prevents moisture loss. Mix the two ingredients, add to the spray bottle. A light spritz of this homemade spray will tame your flyaway locks. If your hair is of medium density or a wavy texture, an oil based leave-in conditioner is a better option. Apply an even coat after towel drying. This helps to seal moisture into your hair before the dry air around you has a chance to rob moisture away. Again, you don’t need a market bought conditioner. Jojoba oil, or coconut oil, or peach kernel oil or shea butter will make a wonderful leave-in conditioner. Rub a small amount into your palms then spread it through your hair. It will give you a great boost of sheen and volume and prevent further flyaway. Obviously, use sparingly and keep away from your roots and fringe. Apparently, plastic combs will make the static problem worse. Use wooden comb as it doesn’t hold any charge and thus will not cause static. Also, combs with wider teeth are better to keep static away. Closely held teeth/bristles can create more friction in your hair that causes electrical charge to build-up faster. Whereas, a wide-tooth comb creates less friction and therefore less static, and thus better for your hair. Since the problem is dry air, a humidifier can bring you immense relief from staticky hair, dry skin, and any other condition that can be effected by dry air. Running a humidifier will add moisture back into your house and make living much more comfortable. Plus, when air is moist, it feels warmer in the house, which will help to keep the thermostat set a little bit lower. An inexpensive option is to put couple of bowls of water in every room of your house. The water evaporation will naturally humidify the room and save you from dryness and static. Hats, scarfs and clothes can charge your hair instantly. Synthetic fibers especially nylon and polyester and their blends are the biggest troublemakers. These fibers can build-up static charge when subjected to friction. However, natural fibers are not all innocent. Wool and silk may also develop static cling, but not to an extent that synthetics do. Which of these tips worked best for you? Or if you have any other tricks you’d like to share, please write in the comment section below! Tnx alot ,it was helpful,furthermore flex seed oil is good for hair beacuse it is source of omega3. Thanks Sarah! Yes flax seeds are excellent for your hair and skin.